SUST Admission Circular 2019-20. SUST Admission Result 2019-20. Shahjalal University of Science and Technology Admit Card & Seat Plan, Questions Solution 2019-20 published here. Shahjalal University of Science and Technology has been published SUST admission notice on their official website – sust.edu. In this notice clear indication that admission will start very soon. But there is a big question that, how to apply in SUST Admission 2019-20. How to get admission Result, Seat Plan, Routine and any others. Guys don’t worry, by this post we will tell and show you A to Z information about SUST Undergraduate Admission Circular 2019-20 academic session. 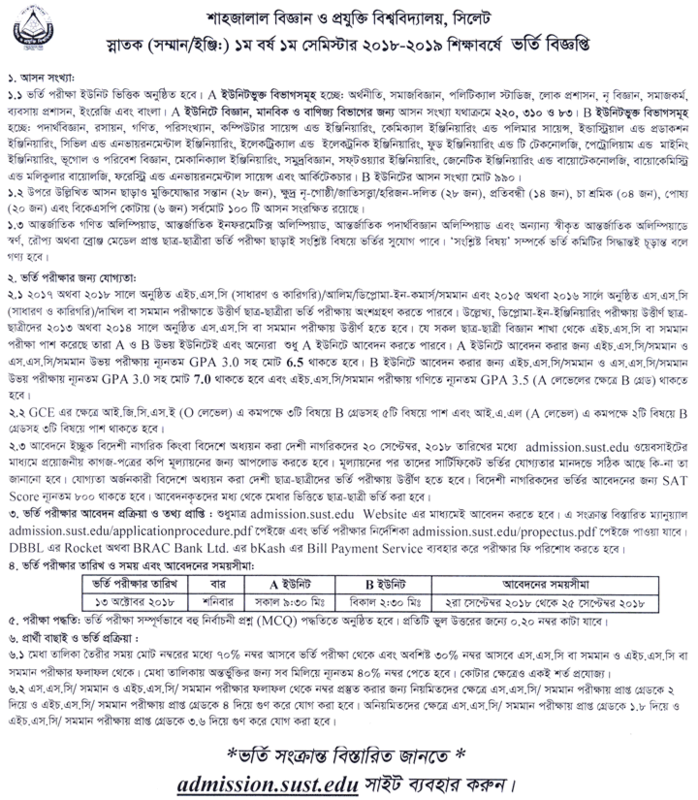 SUST Admission Circular 2019-20 PDF Download will available here. Shahjalal University of Science and Technology (SUST) is one of the best university in Bangladesh. Generally, in our country when a student complete his HSC from any group, than he and she can apply for this admission. Large number of students apply for this admission. There is a limited seats for students. There you have some requirements for this admission. Without their requirements you can not apply for this admission. Here is not end, you must have more requirement to admit yourself in SUST Admission 2018-19 Academic Session. SUST Admission Test Date : _ October, 2019. For G.C.E. students, in O level they must have B grades in at least 3 subjects and ‘pass’ in at least 5 subjects. In case of A level, students must have B grades in at least 2 subjects and ‘pass’ in at least 3 subjects. Subject Wise Eligibility: To get admitted in a department/program one student must have at least 3.5 in H.S.C/Equivalent or B grade in G.C.E A level in the associated subjects. If a student wants to attend the examinations of both A and B units. He must register separately for both units. The sub-units have been formed in such a way that if a student register for one sub-unit. He is not allowed to apply for another sub-unit of the same unit. Sign Up application with HSC Exam Roll Number, Board, Passing Year and Mobile Number. Then you will receive a USER ID and PASSWORD in your provided Mobile Number. Now, go to https://admission.sust.edu/ and sign in your account with USER ID and PASSWORD, then provide SSC Exam Registration, Roll Number, Passing Year, Board and GPA. Upload your scanned photo in 300×400 pixel and if you have Quota, then mention it. If everything okay, then you will receive Bill/Reference Number and inform you fee. Download Admit Card: Using the USER ID and PASSWORD obtained during the registration process, an applicant will have to print 2 copies of his admit (on A4 size paper) from the site http://sust.teletalk.com.bd. If an applicant register for both units, he will have to print two admits seperately in the same way. The applicants are allowed to print the admits from the stated site till November 2019. Seat Plan: There are two units in SUST. A and B Unit. B unit divided in two units. B1 and B2 unit. Abailable seat will update after publish circular. Question Patterns of SUST Admission Coming Soon….. Here we are publish SUST admission question patterns. We also publish previous year admission Question Solution. So please keep on your eyes on our website and like our facebook fan page to get all updates everyday and every moment. Finally, we hope all of your confusion has gone. If you have any Question about SUST Admission Circular 2019-20. Please Comment us on Facebook. Get more update everyday, Please like our Facebook Fan Page and get Updates.